Gluten Sensitivity is a sensitive subject your doctor won't talk to you about. Gluten sensitivity is a very common Autoimmune Disease that is the root cause of chronic illness in many people. This under-recognized disorder has devastating consequences for those who remain untreated. The medical profession claims that this disorder is "rare". But they only recognize its most severe form, called Celiac Disease, which occurs in one in every 133 people. However 33% -or one in every 3 people - carry the genes for Celiac Disease. It is many of these people that, while not having true celiac disease, definitely have gluten sensitivity - unfortunately it is not recognized as a problem in the current medical model. Sometimes called 'wheat allergy' or 'gluten allergy', it is not an allergy in the true sense, as you will soon see. But it IS a REAL PROBLEM for those who have it! Gluten is a protein that is present in grains such as wheat, rye, spelt, bulgar, semolina, couscous, triticale, graham, kamut and durum flour. As its name suggests, gluten is gluey. As such, if you are gluten intolerant, you cannot digest the gluey gluten portion of the protein. This undigested gluten forms deposits on the intestinal walls which the body recognizes as a foreign substance and sends the immune system into the area to “kill” this “foreign” invader. This Immune System response creates antibodies to the gluten protein that sensitizes the body. The next time that gluten is ingested, the body again sees the gluten as foreign and sets up a continual attack each time gluten is eaten, leading to the severe cellular damage known as Villous Atrophy that sets you up for autoimmune diseases and other serious chronic illnesses that get labeled 'incurable'. And in our society, gluten is eaten at least daily - even 3 to 6 times daily - launching an immune system response each time! 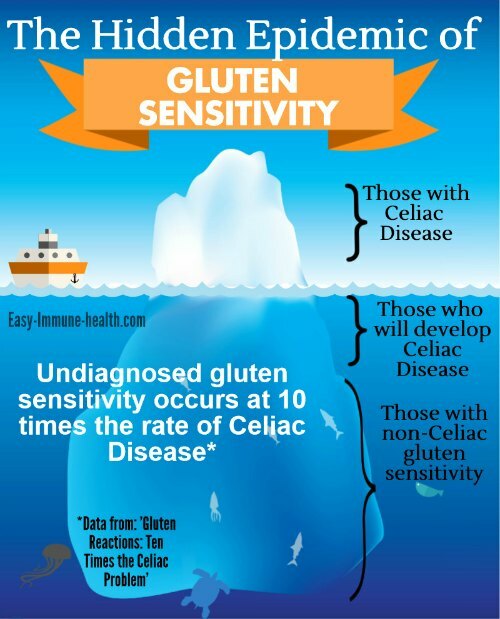 This is only the tip of the iceberg for people with gluten intolerance; this immune response sets up a whole devastating chain reaction that involves, not just the digestive tract, but the entire body – as you’ll soon see. While gluten sensitivity lies on a spectrum of severity, even the mild form causes chronic problematic Symptoms of Gluten Intolerance that, unfortunately, are usually never diagnosed. The local immune response in the digestive tract begins to cause inflammation and damage, leading to digestive symptoms like: bloating, diarrhea, constipation, gas, gastroesophageal reflux, gastritis, colitis symptoms, cramping, etc. Even diagnosed gastrointestinal diseases like IBS and Crohn's Disease invariably have a component of Gluten Sensitivity and/or be completely misdiagnosed Celiac Disease! These symptoms can be severe, mild or even absent depending upon the severity of your gluten intolerance- and can even be as surprising as Gluten Intolerance and Infertility The walls of the digestive tract are lined with immune cells and Good Bacteria that form a protective barrier. This lining protects against infectious agents such as bacteria, parasites, and fungus. If you have gluten intolerance and continue to eat gluten, the constant inflammation wears away this immune barrier and makes you more likely to get infections, from colds to parasites. This inflammation also damages the lining of the small intestine where nutrients are absorbed, a serious condition known as Villous Atrophy. Since this lining is only one cell thick, when it is damaged gluten proteins and bacteria from the food you eat can actually leak out of the digestive tract and into your bloodstream! 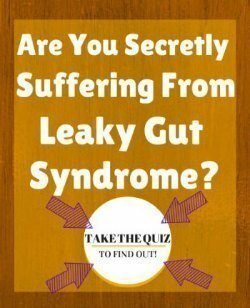 This condition of Increased Intestinal Permeability or Leaky Gut Syndrome not only creates a whole body immune reaction -but can contribute to what we call Early Symptoms of Fibromyalgia, and is the probable cause of autoimmune disorders and most other chronic health problems!! This damage can continue until the finger like projections of the small intestine, called villi, are completely destroyed. This is a condition called villous atrophy that I go into more detail about on the Diagnosing Gluten Allergy page. The main symptoms from gluten intolerance are fatigue, depression and weight gain - often, gastrointestinal symptoms are not even present! When you don’t properly absorb nutrients, you will have food cravings and feel tired. 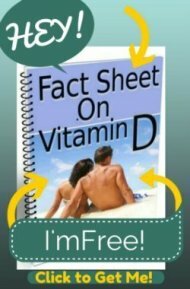 Without proper absorption of nutrients, mineral and vitamin deficiencies can develop. Muscle Cramping, a common symptom of gluten sensitivity, can be a Symptom of Magnesium Deficiency. An inability to absorb calcium can lead to osteoporosis. B vitamin deficiencies can create feelings of restlessness and an inability to relax, making sleep difficult- another common symptom of gluten intolerance. When the immune system continually damages the lining of the digestive tract, the Good Bacteria that provide protection from foreign invaders are killed as well. This sets you up for conditions like 'gut dysbiosis' or Candida Overgrowth Infection. Candida are yeast that normally live in the digestive tract along with the good bacteria. But there is a constant battle between the good bacteria and the candida for space. When the good bacteria get killed from the immune reaction, it allows the candida to take over that open space. This can set up a whole host of problems. Good bacteria protect us from foreign invaders, but produce enzymes and nutrients that are essential to our well-being. This overgrowth further compromises our digestive capabilities and sets off more immune responses in order to get rid of the excess candida. Another reason that candida is a problem is that it MUST have sugar from our food sources to survive. When candida is present in excess, then you now crave sugary foods. It's a lose-lose situation for your digestive tract and you must eliminate the candida or repopulate the gut with bacteria through the use of probiotics and prebiotics such as Resistant Starch. We talked about sugar cravings from the candida overgrowth in the gut, but there are other things going on that create powerful cravings as well. The reaction of gluten proteins in the gut creates a substance called gliadomorphin. This morphine-like compound causes you to become physically addicted to the gluten that is creating so many problems! This is the reason why you crave carbohydrates. You actually become “addicted” to them in much the way an alcoholic becomes addicted to alcohol! Specific cells lining the intestinal tract create enzymes to digest food and these, too, are damaged in this process. If you can’t secrete the enzyme lactase, lactose can no longer be digested and you become intolerant to milk as well! And to top it off, the undigested dairy protein, called casein, reacts in your gut to make ANOTHER morphine-like substance called caseomorphin. So you become intolerant and addicted to dairy as well!! So, at this point, if gluten sensitivity is left untreated, you will crave wheat, milk and sugar - exactly the foods that are the worst for you!! The damage from gluten may also cause you to lose your ability to digest protein - which can lead to a deficiency in amino acids, the building blocks for neurotransmitters, one of which is Serotonin. Low levels of Serotonin are linked to depression and insomnia. If you don’t absorb fats, then you won’t have the building blocks to synthesize hormones. This can create hormone imbalances such as Adrenal Gland Fatigue and poor thyroid function that will interfere with your immune system functioning and your ability to handle stress. Hormones also have a major effect on metabolism and the ability to process fat and carbohydrates. Imbalance in the hormone insulin can lead to weight gain and eventually to diabetes. While celiac disease, the most severe form of gluten intolerance, is recognized by medical practitioners, there is a whole range of gluten intolerance that is NOT recognized, but that can profoundly affect your health. If you have ANY chronic illness, from Symptoms of Fibromyalgia to Atrial Fibrillation to autoimmune disease, it is important that you make sure that unrecognized gluten intolerance is not the cause. If you do have gluten sensitivity, unless you stop eating gluten, any treatment for chronic illness will likely only provide temporary symptom relief. Many people even find that the gluten intolerance WAS the cause of their problem, and once gluten is eliminated, the chronic illness is eventually eliminated too!! A lot of pain and suffering could be prevented if western medicine recognized the entire spectrum of gluten intolerance. But unfortunately they don’t. Even many people with full-blown celiac disease don’t have their symptoms recognized until much damage has been done and they have acquired other chronic illnesses as a result of their disease. But even worse are the people with mild and moderately severe gluten intolerance who are actually tested for celiac and are told that they don’t have it! 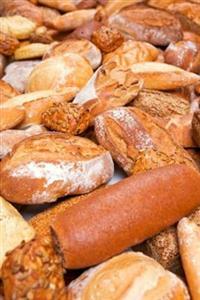 The number of people with chronic health problems who are gluten sensitive is VERY HIGH. It's SO high that I encourage all of my clients to do a 60 day trial of gluten free eating by following the instructions on my Gluten Intolerance Diet page and learning all that you can about how 'Real Food' is the secret to good health. Get the summit today, it's GUARANTEED that you'll love it! as a resource- to test themselves for this unrecognized health problem. While I have access to testing for gluten sensitivity, keep reading to find out about why getting testing for gluten sensitivity is NOT the best way to find out if you have this devastating illness. I've known for some time now that I have a sensitivity to gluten, can this be linked to my vitamin D deficiency? Do you know if gluten sensitivity causes sarcoidosis and could a gluten free diet be a possible sarcoidosis treatment? my grandson aged four is autistic and gluten intolerant.Are the two disorders related? Am I that gluten sensitive? Could My Anemia Be Related to Gluten? Could my Constant Hunger be Gluten Sensitivity? Sugar Cravings After I Eat...Could It Be Gluten Intolerance..
intersitual cystitis is there a link to gluten sensitivity ? Migraines - Low Blood Sugar - Gluten Sensitivity - Is there a link? Gluten Intolerance and low progesterone.